Arctic Char: a cold-water fish in the family Salmonidae, native to alpine lakes and arctic and subarctic coastal waters. The Arctic char is closely related to both salmon and lake trout, and has many characteristics of both. The fish is highly variable in colour, depending on the time of year and the environmental conditions of the lake where it lives. Blue Point: a small oyster (Crassostrea virginica) typically from the south shore of Long Island. Bronzini: Often referred to as a Mediterranean Sea Bass, this fish can be easily prepared using olive oil and seasonings such as garlic, various herbs, sea salt and pepper to be roasted in an oven, on a stovetop or grilled. The sweet-flavored, semi-firm white meat of the Bronzini tastes somewhat like a red snapper. Calamari: Squid served as food. Catfish: Ray-finned fish with whiskers that are reminiscent of a cat's. Catfish has been caught and farmed for food in Africa, Asia, Europe, and North America. Conch: Type of sea snail used to make various soul food items such as gumbo and fritters, taking influence from the Bahamas and Jamaica. Edamame: Immature soybeans in a pod that are typically served boiled or steamed. Etouffee: a spicy Cajun stew made with vegetables and seafood. 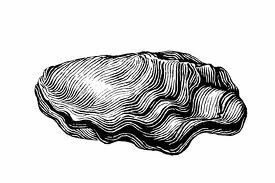 Oyster: Salt water bivalve in the mollusk family that is consumed raw or fried. Some oysters are harvested for the pearl product. Olympia Oysters: Olympias make the tiny Kumamotos look like giants, often coming in about the size of a quarter. They are the only oyster native to the West Coast of the U.S. Their popularity in San Francisco during the Gold Rush almost wiped them out, and they were believed to be extinct for decades. Wild populations still exist, however, and are strictly protected. Olympias at the market and in restaurants are cultivated, mostly in the Puget Sound and British Columbia. Olympias are sweet, coppery, and metallic. Pacific Oysters: Pacific oysters are small and sweet and the world's most cultivated oyster. Pacifics have a distinctly more fluted, sharply pointed shell than Atlantics or European flats. Today, Pacifics are usually named after where they are grown, such as Totten Inlet and Fanny Bay, but some are trade names such as the justly well-known Sweetwater oyster from Hog Island Oyster Company. Kumamoto Oysters: Kumamotos are small, sweet, almost nutty oysters characterized by their deep, almost bowl-shaped shell. Like Pacifics, they have deeply fluted, sharp, pointy shells. They spawn later and in warmer water than other oysters, so they remain firm and sweet well into summer months. Kumamotos are widely cultivated in Japan and the West Coast. European Flats: European flats are characterized by their smooth flat shell (no surprise there!) and lovely seaweed and sharp mineral taste. They have a meaty texture and, for those used to different kinds of oysters, almost a crunch to them. Paella: a Spanish dish of rice, saffron, chicken, seafood, etc., cooked and served in a large shallow pan. Poke: a raw fish salad served as an appetizer in Hawaiian cuisine, and sometimes as a main course. Increasingly popular ahi poke is generally made with yellowfin tuna. Scallop: n edible bivalve mollusk with a ribbed fan-shaped shell. Scallops swim by rapidly opening and closing the shell valves. She-Crab Soup: Rich soup made of milk or heavy cream and crab stock and crab roe. Regional specialty of South Carolina Lowcountry. The name comes from using female crabs for their roe. Shrimp: A type of crustacean and is synonymous with the term prawn. They are typically found on the coastal regions in addition to rivers and lakes. Snapper: Type of fish found in the Western Atlantic Ocean and the Gulf of Mexico. Surf n' Turf: a dish containing both seafood and meat, typically shellfish and steak. Wakame: an edible brown seaweed used, typically in dried form, in Chinese and Japanese cooking.